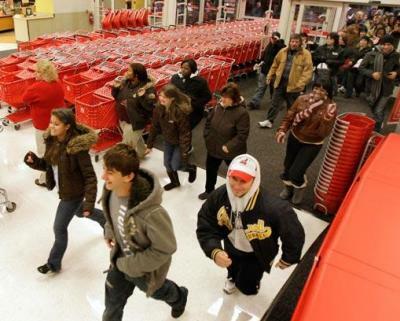 “Black Friday” and the Christmas season it ushers in seems to come earlier every year. This year’s particularly disturbing trend is that some retailers are opening at midnight. And some retailers I’ve heard are even starting the shenanigans at 9pm tonight or even earlier. With the possible exception of some seasonal hires, none of the rank-and-file employees at these stores knew, or could have reasonably anticipated that they would be askeddemanded to work these ridiculous hours — probably under threat of termination and most likely at their regular wages. Additionally, I’d wager that almost none of these employees are really OK with this arrangement, that is, they are essentially “agreeing” to these conditions under duress. It’s just the natural offshoot of a sick corporate profit-only culture that always prioritizes the bottom line over its employees’ sanity and well-being, whether you are a cashier at K-mart or a cube-jockey somewhere in corporate America or anywhere in between. These workers often seek secondary employment out of economic necessity, but it would seem their employers go out of their way to make it difficult or impossible to do so. When I was younger and working various part-time jobs (bars, restaurants, etc.) typically you could expect a working schedule that was at best unpredictable: posted no more than a few days in advance, and not uncommon to have only 24 hours’ notice that you were expected to be at work tomorrow night. Due to this unpredictability, it is difficult to maintain a job at another company because eventually your schedules are going to conflict, and you’ll be forced to choose which job you want to be fired from. Further, most of these jobs also had some variations on non-compete policies. It’s one thing to say that the CEO of Sears should probably not also work for Wal-Mart due to conflicts of interest, but it’s retarded to say that the $7/hr stock boy at same should be barred from seeking supplemental income/employment from a “competitor” if/when he is unable to obtain adequate hours/income at one or the other. Although this clause is rarely enforced, this agreement means that even without an actual conflict, they can fire you for having the audacity to try and earn more money somewhere else — even though they’re unwilling to offer you an opportunity, wages, or hours to do so! In order to remain an employee in good standing, you the employee will need to be available at the employer’s unpredictable beck and call, on practically no advance notice. And even though the employer will not offer or guarantee you a sufficient living wage or enough hours to meet your financial needs, employer intentionally (or ignorantly) makes it difficult/impossible for you to maintain another job to make up for this one’s shortcomings. It is only possible in a market perverted. Human needs and wants are practically boundless, and to satisfy these desires requires labor. In a freed market, there would be a directionaly similar demand for labor — NOT a race to the bottom which can only exist when opportunities are stifled and the complimentary factors of production are monopolized.